1. I like the ability to lay things out exactly the way I want to. Yes, I know I'm a control freak. 2. I never have to copy information from one year to the next. Everything stays in one convenient place. 3. 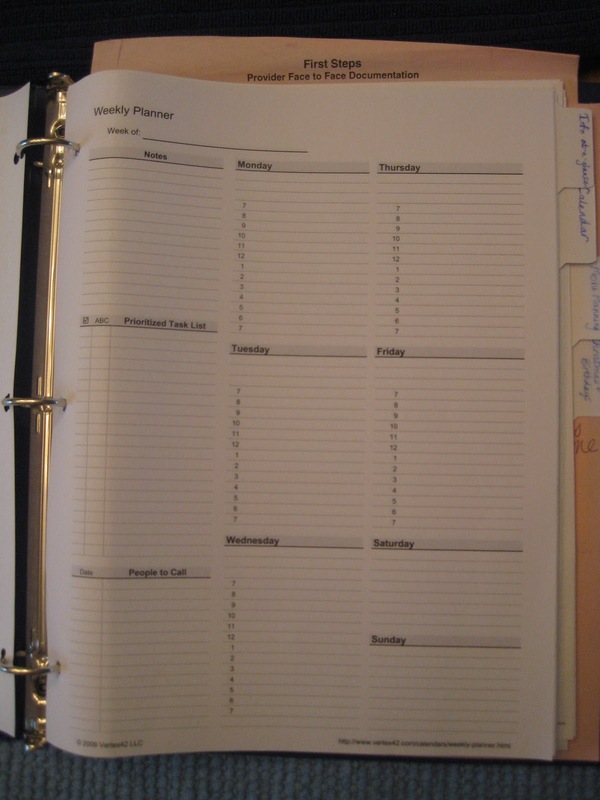 There is additional planning information in my binder that would never be included in a regular calendar. Currently, there are sections for weekly and monthly calendars, babysitter information, emergency and medical information, Christmas/birthday ideas and needs, meal planning, and projects. 4. Because I do not carry my binder with me at all times, I can step back and be more thoughtful about making commitments. If we're asked to be somewhere, I will honestly say, "I need to check my calendar at home." Then, in addition to checking the calendar, I have the opportunity to talk with my husband to be certain that he's up for whatever schedule addition is in question. We're in the process of beginning ministry in addition to work and a young family, and I have to be careful not to fill up the calendar with no room for rest (and laundry). I love people. I can overcommit us in a hurry. Enough said. 5. It holds important papers. In the pockets, I have room to tuck important documents that I'll be using in the weeks to come (or even recipes that I'm planning to use). 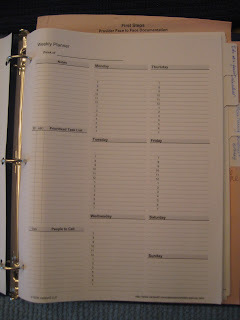 Here's how the different calendar sections work (more on the other sections on a different day). The monthly calendar is a printable I've gotten offline. I fill my binder with 12 months of calendar pages at the end of the previous year (when events for January start to pile up) so I don't have to think about it again. Immediately, I write it in unquestionable commitments: birthdays, anniversaries, and holidays (according to Teacher Man's school schedule). Next, I write in ongoing commitments. I mentor a group of girls at my church, and we meet every Wednesday night. You'd think that would easy to remember, but I've had two beautiful children. I'm convinced they've killed many brain cells. I need to write everything down in my calendar. As time goes by, obviously events build up. We try to limit the number of events we have in our day, mostly so my brain will not implode. 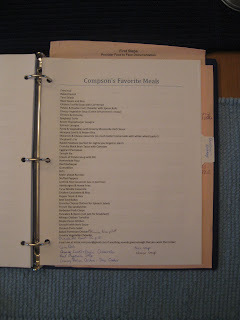 For the first year of marriage, I never knew what to cook and would often forget the things we liked which is why I made a list to refer to when I need inspiration. This alone saves me a headache every two weeks. 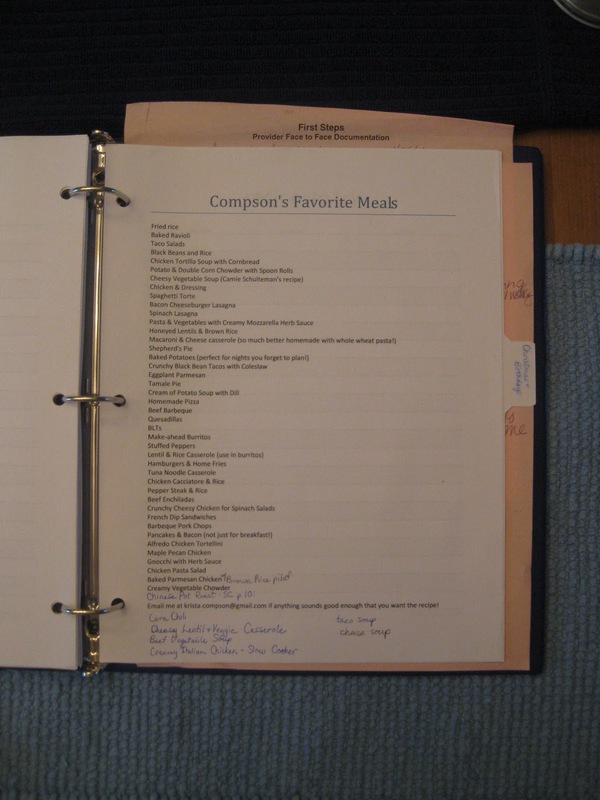 I write the meals I'm going to make right on the day I plan to cook them so I don't plan a major prep-heavy meal for a day when I have another big commitment. When I put down a meal on the calendar, I also write ingredients that I need (that aren't in my cupboard) to prepare the meal on my grocery list. By using my calendar, I can also see what birthdays I need to buy for or if there will be any special functions I need to cook for. This saves me so much time! Invariably, our local store will have great sales on things that are not in my meal plan. If they are non-perishable, I buy ahead and plan to use those items for the next biweekly meal plan. If they are perishable, I tweak the meal schedule. I'm also a firm believer in the power of my freezer. We buy beef by the quarter cow so I never need to watch the sales for red meat. Also in my freezer are several loaves of bread, chicken breasts (which I buy in bulk when it goes on sale), frozen veggies and fruit (also bought on sale), and juice concentrate. Another mom and I do a momswap (trade babysitting). Yesterday, I used my momswap time to grocery shop, and let me tell you it was bliss! We should be all set for the next two weeks. That is an amazing feeling! Though I definitely don't need this every week, there are some weeks that Teacher Man and I fill out a weekly calendar together. This is most necessary in the summer when we're focusing on ministry goals from our home and need to coordinate childcare, meetings, and phone calls. This week I used the weekly calendar because we have a lot of activities and a major trip. I want to make sure I have a time set for everything: laundry time so I'm not up late packing before our trip, cooking time so I have the littles' food packed for our time away, and finally packing time so our departure is as smooth as possible. Hope that makes sense. 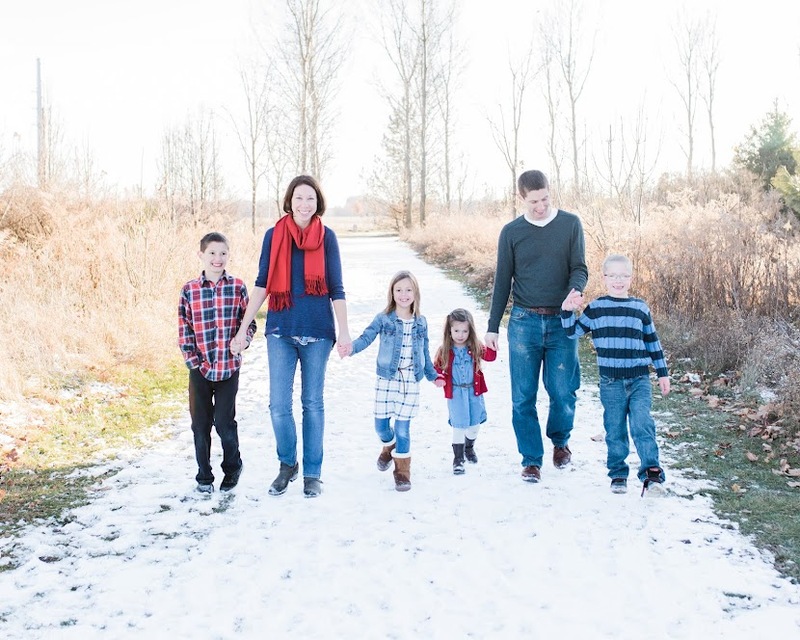 It's taken me a couple of years as a stay-at-home mom to figure out what works for me. If that saves you any time at all, I hope you can use that time to drink an extra cup of coffee (preferably with pumpkin spice creamer) and spend some time with the Lord in His Word. I'll share more on the other sections sporadically. If I don't share about the grandkids, certain readers complain :-). Blessings on your day! Wow, Krista you are my hero! 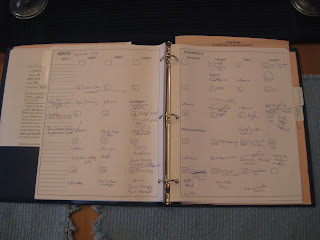 I wish I were that organized! I do my meal planning like that too but I do my shopping once a week. (I coupon) Although I probably have enough food on hand, minus produce, for a month or so. Where do you buy your meat? My hubby and I have been talking about doing that for a while now and we don't know where to start. Ok. I have a couple of questions. First, what information would you have to transfer over year after year to a new calendar that you already don't transfer to a new year in the binder? And...where do you buy a quarter cow? a lot of that will be in future posts (emergency, babysitter, medical info, important dates, gift needs). These are pages I keep so I don't have to redo them ever again. Most people probably just keep that info in another place. We buy the cow through friends of friends who raise a handful of cows and butcher a couple in spring and a couple in fall. This last time though we just bought some hamburger at a great price because I still had lots of roasts. Super helpful and really yummy. Interested?